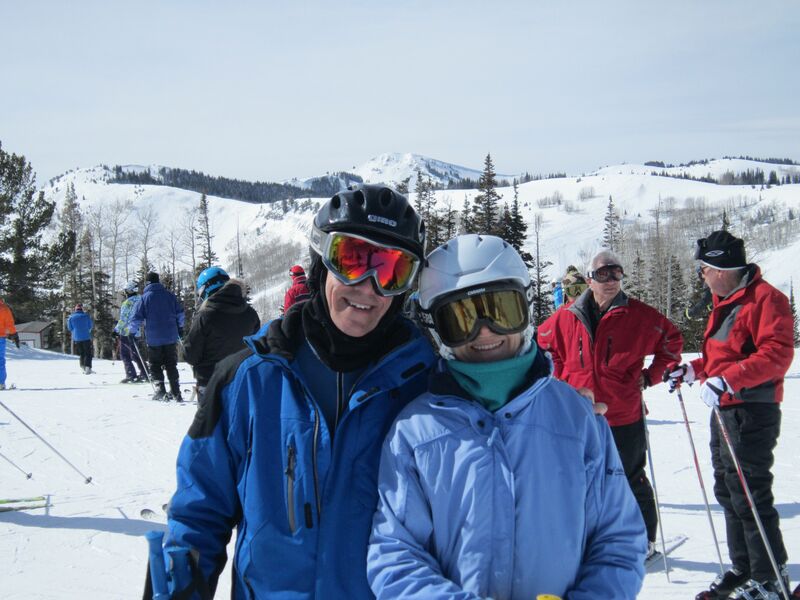 As much as I love skiing the big mountains of Utah, I had mixed feelings last week as we headed out to Park City. Vision in my left eye has been very limited, which has affected my depth perception and balance. But exploring physical limitations is part of what makes skiing interesting. I was looking forward to the kinetic excitement and raw alpine beauty, and to seeing old friends. Our flight through Dallas went smoothly, and it was snowing hard when we landed in Salt Lake City. We took a shuttle (which our driver called “the Love Van”) up to Park City over snowy roads through limited visibility. When we arrived, some of our friends who’d arrived a day earlier were sitting by in the living room by the fire, and others were in the hot tub in the back. After saying hello, we walked three blocks to the lift area and to rent skis. I went with Volkyl Mantras, an all mountain ski I’d liked in previous editions, and which turned out again to be highly versatile in changing conditions (powder, groomed carving, chop, and bumps). The next morning I cracked a good sweat trying to jam my feet into my ski boots, and for a few moments I thought they simply would not go, but in the end they did. The day was cold (low teens), but we were dressed adequately (five layers over the torso and two over the face). There was not as much powder on the mountain as we’d hoped, but on the whole the snow was light and workable. After doing two or three groomed runs, Sally and I tried some bumps. 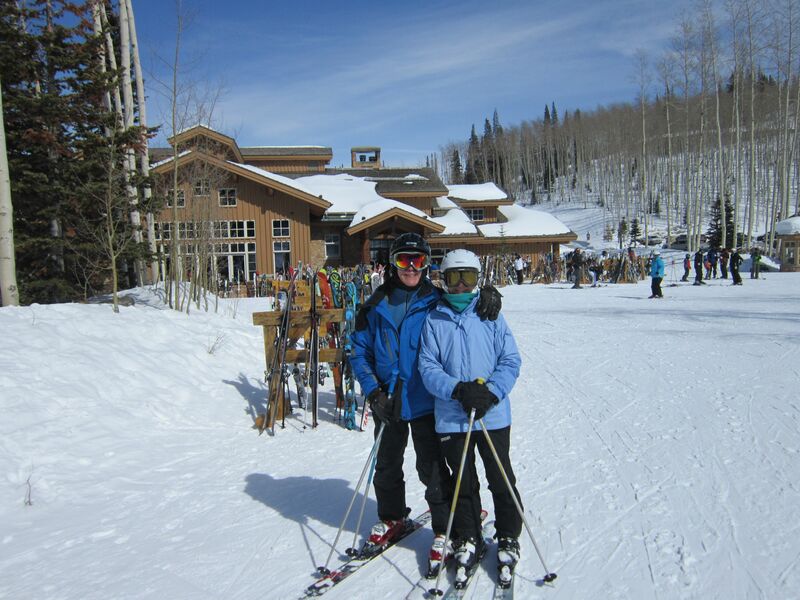 We were a little rusty at first, but managed ok.
We ended up skiing the first two days at Park City and the last two at Deer Valley. The usual knock on Deer Valley is that it’s too sweet, with such amenities as good on-mountain restaurants, comfortable lifts, and careful grooming. This is not untrue — the food, lifts, and grooming are quite nice — but it’s also not the full story. We loved the skiing there. The system is elegantly laid out and linked together. There were almost no lift lines. Yes, there are a lot of cruisers, but they’re really good cruisers, some quite steep, and there are also some exciting bumps and gladed areas. At this stage of my ski career, I enjoy the rush of shooting down groomed cruisers, but I soon find myself craving more varied and challenging terrain (typically rated as black or double black diamond). Finding the right degree of challenge is part of the secret of happy skiing. When you’re right at the inside edge of what you can handle, you experience a special type of happiness. During th event, you don’t know your’re happy, because you’re completely focused and absorbed in solving the intricate speed chess problem of the next few dozen yards. The challenges are constantly changing. This is an aspect of flow, which I read about last year in Flow by Mihaly Csikszentmihalyi, another book which has some worthwhile ideas but too much padding. Anyhow, I try not to spend too much time just doing those things that come easily. This trip I was focusing on steep moguls,and found myself getting more adept at them. Here’s my tip, which I got from a teacher in Telluride: getting pressure to the inside edge of the down hill ski about twelve inches from the tip. Particularly when coming into the backside of a mogul, force this spot down into the snow. This causes you to press your weight forward, with your shins driving hard into the tongue of your ski boot. This technique helped me stay out of the back seat, which is where problems usually develop, and to feel well in control. Anyhow, I felt stronger and more confident on the slopes than last year, or ever. It could be my personal trainer’s innovations, yoga, more swimming, foam rolling, or eating a healthier diet. Or perhaps a combination of some or all of these. At any rate, we skied hard every day, with many exciting challenges, and my legs never gave out. My vision problem didn’t hamper me too much. Especially in more crowded areas, I tried to be conscious of looking around carefully for other skiers, but we usually stayed away from those places. It’s possible that my hearing and sense of touch were carrying more load. It’s also possible that adrenaline increased the speed of visual processing, and cropped some of the bad signals from the left eye. At any rate, I was able to forge ahead. Sally really lifted her ski game this year. She was going much faster and looked relaxed and happy. I persuaded her to change out her trusty white cap for a white helmet, which she agreed was comfortable and warm as well as safe. It was a pleasure to watch her.